“Then join hand in hand, brave Americans all! By uniting we stand, by dividing we fall!” – Founding Father John Dickinson in his pre-Revolutionary War song “The Liberty Song”, first published in the Boston Gazette in July 1768. I have to be motivated to sit down and write my weekly reflections. It’s not something I plan, but then some random thought comes to my mind that just doesn’t quit. Sometimes something bothers me to a point that I may feel compelled to work it through my mind. I believe there is not only a solution but an opportunity for improvement for everything that we encounter in our lives. Although “good” is subjective, I believe that if we perceive something as good, there is always an opportunity for it to be better. If we perceive something to be not good, there is definitely an opportunity for it to be better. I also try to not be political in my writings here. This article is, in no way, a political argument or a political statement, but just a reflection on my concerns and unsettled feelings. So, as it happened, “United we stand, divided we fall” popped into my head sometime today. With all the craziness that’s been occurring in our world and in our society, this might be a concept that we need to rekindle. In our communities, there are many things that affect an individual person or an individual group of people. I believe that, when we become divided, or when we don’t care about each other, there becomes a disconnection and what I believe turns into an “us” against “them” mentality. Just watch the news to see evidence of stories where this may be an ultimate root cause. The intention of the Enjoy Life Community™ project that I’ve been working on over these past years has a huge potential to bring people together. I am confident that this can provide a better life for many. However, my main thinking today has revolved around the horrific hardships and violence that have been the forefront of our news over these past days. I read a statistic that there have been 355 mass shootings in the United States in the year 2015. This is an unconscionable number. And, what is happening? We are horrified that an event happens and then we forget… Or we are horrified for a moment that an event happens — but, for goodness sake, after 355 mass shootings in one year, I think we have become significantly desensitized. At this point, I have begun to wonder where the people in our communities demanding answers and solutions are. It is evident that we need to start to work together to protect our communities, our people, and our children. The United States of America is a unique Country. It was formed on the principles of life, liberty and the pursuit of happiness. I think many people currently take our liberties for granted. So many people don’t vote. So many people are so silent because they figure it won’t matter anyway. In our world today, there are so many people who live in fear and in oppression. And, throughout time, there have been many great empires that have been lost. I believe we have to assure that the United States stays strong for our children and for our children’s children. As promised by our Founding Fathers, I believe we are all people with different beliefs and deserve to coexist. I believe that we are all people and we are all EQUAL. I believe it is unacceptable for any group to instill fear and/or try to impose their ways on others. By the end of my weekly articles, I usually have a way to summarize and end my article. However, in this case, I have no way to create a resolution or a direction for an ending. All I do know is that this is the United States of America, and I believe that we must address any concerns to protect our way of life. 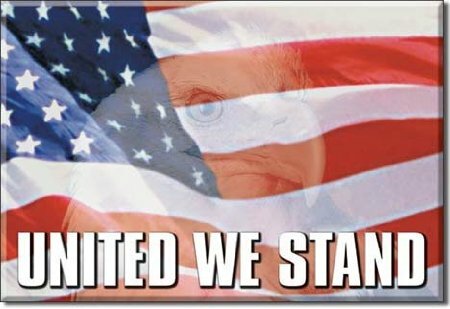 United We Stand. God Bless America.